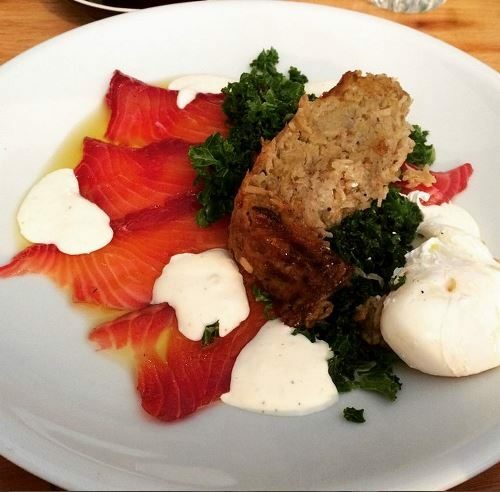 This post is an extract from my Amsterdam Restaurant Guide – want to eat more than just brunch? Download the full guidebook here! I first discovered Little Collins’ excellent line in international brunch dishes, from kedgeree to shakshuka, at their original location in de Pijp. But I later discovered they do dinner as well – and they now have a new location in West, too. The menu is very international, which I would usually avoid, but they do so many things well. The chef is Australian, and of course Australian cuisine is a melting pot of influences from Europe, Asia, America… you name it. I usually order a rhubarb bellini and/or a coffee while I’m waiting for brunch – and you can’t go wrong with one of their Asian dishes, like smoked tofu or pork belly with kimchi. 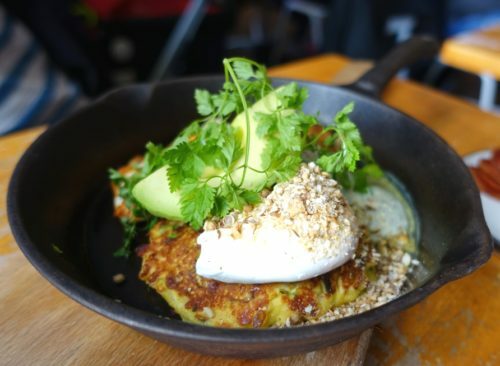 Little Collins was the first to bring Antipodean brunch culture to Amsterdam, and a few other copycats have sprung up since – but none are as good as the original! As well as serving up an excellent brunch, Dignita is excellently set up for families with kids. I love Dignita’s chickpea and courgette fritters with fried halloumi, poached egg, avocado, dukkah and a mint-yoghurt dressing. The fritters are moist, the egg perfectly poached, the textures well balanced – all in all, a lovely dish. Their coffees and breakfast cocktails are good too, and even the service is quick. If you are child-free, escape to the stroller-inaccessible mezzanine level at the Vondelpark location. There’s also now a new location near the Hermitage Museum. Dignita’s courgette and chickpea fritters – my favourite! Despite the fact that Gartine is sandwiched between the Kalverstraat and the Rokin in the centre of town, it has its own moestuin (allotment) in which they grow much of the produce you’ll eat at the restaurant. I should more properly call it a “tearoom”, as it’s open for breakfast, lunch and afternoon tea, but not dinner. The location is delicate and classy, but in an old-fashioned way – as if your grandma had taken a degree in interior design. The food is likewise: eggs benedict with salmon for breakfast, crayfish rillettes for lunch, and a plethora of tarts and cupcakes at tea time. 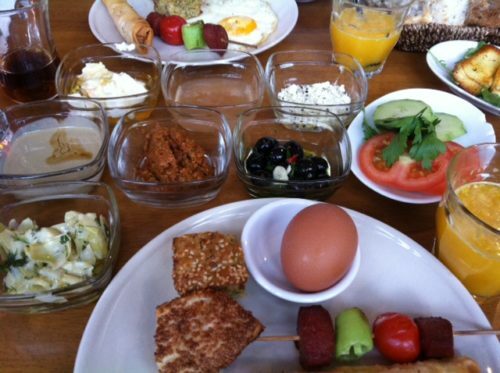 One of the things I enjoyed most about my trip to Istanbul was the incredible Turkish breakfasts. So, if you’re looking to get your fix in Amsterdam, you’ll be happy to stumble upon Mozaiek. The Turkish brunch I had there included everything from filo-cheese cigars and chorizo skewers to fried halloumi and dozens of dips and toppings for bread. The individual portions weren’t huge, but there were enough of them that you certainly didn’t go hungry for a very reasonable €13. 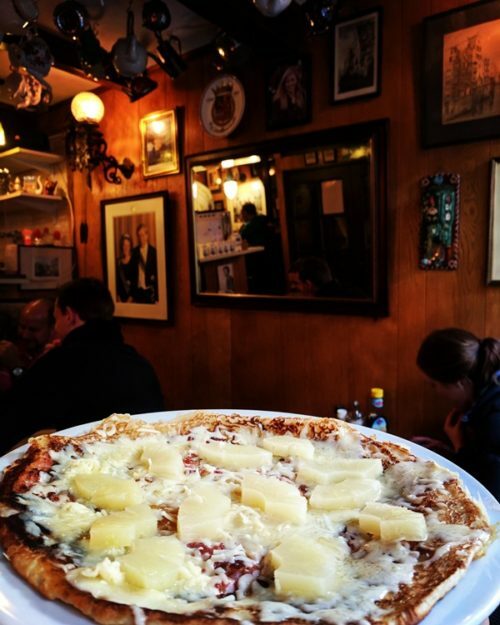 You can’t come to Amsterdam without experiencing the gluttony that is Dutch pancakes – especially if you have a hangover. These bad boys are the size of dinner plates and as thick as pizzas, with both sweet and savoury toppings. My favourite pancake house is Pannenkoekenhuis Upstairs, which is (unsurprisingly) up an extraordinarily steep and narrow flights of stairs – even by Dutch standards. It’s a tiny place, and easy to miss, but worth it once you get inside. Teapots hang from the ceiling in every size and shape, and the pancakes are buttery and satisfying. It’s one of my biggest pet peeves, not being able to get a decent omelette in Amsterdam. I frequently seem to be served up thin, dry egg pancakes rolled up with cold stuff in the middle. Omelegg is one of the rare exceptions: whether you’re hungover or just hungry, a huge mound of eggs stuffed with everything from sausage to cheese to veggies is sure to set you right. Their original branch is in de Pijp, but they’ve more recently opened up a second location near Centraal Station too. Looking for more must-eats? Download my comprehensive Amsterdam restaurant guidebook here.